A 3D printed fiddle has already been created, and we can now add 3D printed bagpipes to the list of 3D printed instruments. While not something that can be sold, it does make for an interesting piece to have around the house, should you ever get the need to play some bagpipes. 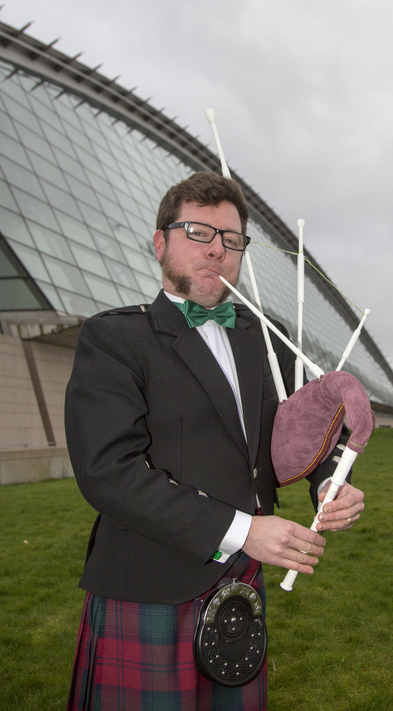 Donald Lindsay completed the very first set of 3D printed bagpipes in February. A bagpipe enthusiast since childhood, Donald fell in love with the bagpipes when he was in his teens. Having been fascinated with them ever since, it’s no surprise that Donald would begin a 3D printing project to create the very thing he loves. In early 2013, Donald began the process and by February of this year he had a full set of Scottish Smallpipes. Donald began learning 3D printing and modeling at a local MakeLab in Glasgow, UK. The first print was done in London at 3DprintUk, where the basic design of the pipes were first introduced. But the cost wasn’t cheap, so Donald started to look for funding. He launched his 3D printed pipes on the well-known site Kickstarter in hopes of funding the project so he could complete it, and add more refined features. As every musician knows, fine-tuning is of the essence. That is what Donald hopes to be able to accomplish with the funding. “I’m looking to stabilize the instrument in the second register, perfect the tuning, improve the tonal color, and refine a chanter in every pitch that is practical,” Donald says. If you are interested in helping Donald see the end of this project, head over to Kickstarter. A small pledge will also give you the files needed to create your own set of pipes as well as a penny whistle and practice chanter.